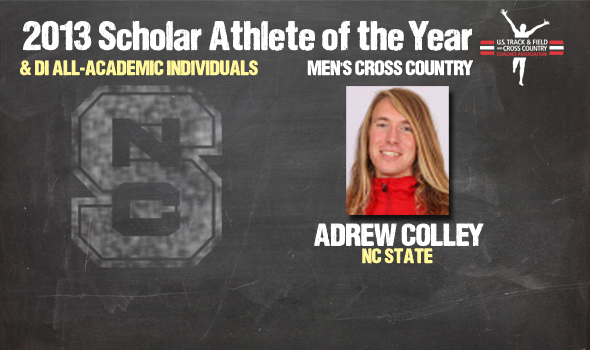 NEW ORLEANS – Andrew Colley of NC State has been named the U.S. Track & Field and Cross Country Coaches Association (USTFCCCA) Division I Men’s Scholar Athlete of the Year for the 2013 cross country season among 72 men who earned USTFCCCA All-Academic honors. Colley, who finished seventh at the 2013 NCAA Division I Cross Country Championships, earned Scholar Athlete of the Year status as the best individual finisher at the NCAA Championships who earned a cumulative grade point average of 3.25. A senior accounting major from Williamsburg, Va., with a 3.397 GPA, Colley traversed the 10K course at the LaVern Gibson Championship Course in Terre Haute, Ind., in 30:12.44 for NC State’s highest-ever individual finish at the meet. Prior to the NCAA Championships, Colley claimed the ACC Championship individual crown and finished runner-up at the Southeast Regional. His season also included third- and fourth-place showings at Wisconsin’s adidas Invitational and Minnesota’s Roy Griak Invitational, respectively. He is the first Division I man from NC State and the ACC – or an East Coast school, for that matter – to earn the award. Colley was one of 72 men in Division I who earned USTFCCCA All-Academic honors for the 2013 cross country season. Honorees must have compiled a cumulative GPA or 3.25 or greater and must have finished as an All-American or among the 15 finishers (or 10 percent) in his regional meet. Those 72 men hail from 49 different institutions and 20 different conferences. Syracuse was the best represented program with four individuals, followed by Kansas, Georgetown and Tulsa with three apiece. The ACC and Big Ten conferences both led the way with nine each, followed by the Big 12 with eight and the Big East with six. Five student-athletes reported 4.0 cumulative GPAs, including four seniors in Lucas Cotter of Chattanooga, Solomon Haile of Arkansas, Joshua Hardin of Northern Arizona and Reed Kamyszek of Syracuse. First-year student Ben Saarel of Colorado was the fifth. Of the 45 All-Americans, 19 earned All-Academic honors; as did nine of the top 25 finishers.